Differences between plugs Some plugs have a sealing washer atthe top of the threaded part. Others have a tapered seat,and are easilyovertightened. A 'hot' plug looks like a 'cold' one; the extra length on the nose is on the inside. 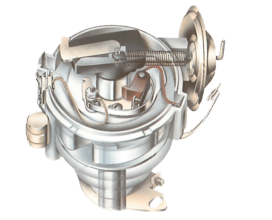 However, some plugs have a sealing washer at the top of the thread, while others have a tapered 'seat'. They fit into different types of holes, and must be tightened differently. Some plugs have a fixed terminal on top and some have terminals that can be unscrewed. Make sure that a terminal of this type is on tight - use pliers if necessary. Check and clean sparkplugs every 5,000 miles (8,000 km) and replace them after 10,000 miles (16,000 km). Their condition can tell you about the condition of the engine, and help you to correct faults elsewhere. Always use the type of plug recommended for your car, except as an exceptional and temporary measure. Plugs are classified as 'hot' or 'cold'. Hot plugs have a longer core nose the ceramic insulator inside the threaded part - which retains more heat between firings. 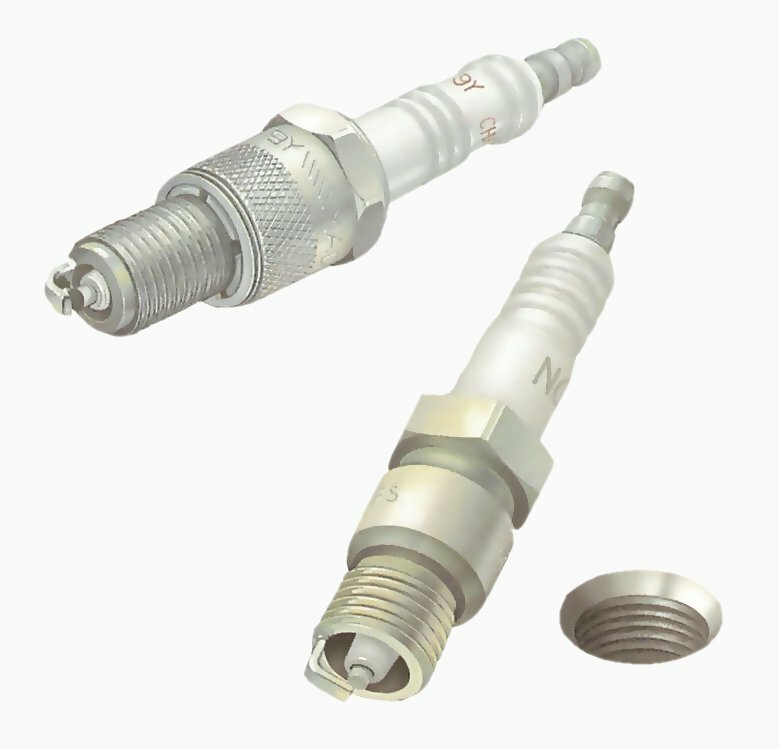 For most cars the sparkplug size is 14 mm, although it may be 10, 12 or 18 mm. Always use a plug spanner of the correct size. The cheapest type is a box spanner and a tommy bar, but you are less likely to damage a plug if you use a special deep socket with a hard rubber lining . For cars with plugs that are hard to reach, you can buy a plug spanner with a universal-jointed head: take care not to let it tilt sideways and break the ceramic top of the plug. This is a danger with any plug spanner; it must fit on straight and as far as it will go. The rubber centre guards against breakage to some extent. Pull off the lead by its cap. Clean away dirt from around the plug with a soft brush. Before removing the leads, label them, using pieces of masking tape, with the numbers of the cylinders from which they come. It is easy to mix them up. Grip each lead by the cap, not by the lead itself; damage here causes misfiring which is hard to trace. A deep plug socket with a rubber liner and a universal joint prevents accidental damage to plugs. After removing the leads, clean around the plugs, using an old paintbrush, to avoid dropping dirt through the plug hole into the engine. For recessed plugs, blow away dirt with a tyre pump. Fit the spanner over the plug, making sure it is quite straight. Unscrew the plug and take it out. 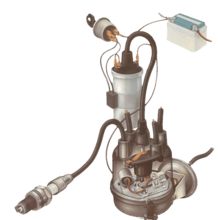 The gap between spark plug electrodes should always be maintained at the distance specified by the manufacturers. It is safe to lever the gap open carefully with a screwdriver, although a gapping tool - which is inexpensive - is best. But do not use pliers, and do not close the gap by tapping the outer electrode - you are likely to crack the insulator inside the plug. The tool has stiff feeler-gauge blades and a file for cheating. 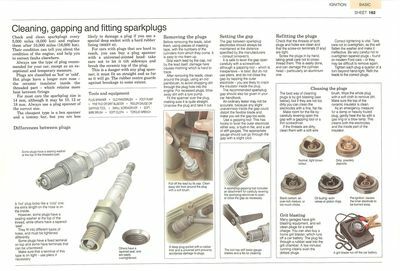 The recommended spark plug gap should also be given in your car handbook. An ordinary feeler may not be accurate, because any slight unevenness inside the gap could distort the flexible blade and make you set the gap too wide. Use a gapping tool. 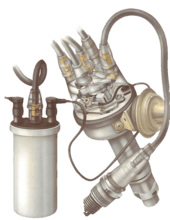 This has hooks to lever the outer electrode either way, a built-in file, and a set of stiff gauges. The appropriate gauge should just go through the gap with a slight click. Check that the threads of both plugs and holes are clean and that the screw-on terminals (if any) are tight. Screw the plugs in by hand, taking great care not to cross-thread them. This is easily done, and can damage the cylinder head - particularly an aluminium one. Correct tightening is vital. Take care not to overtighten, as this will flatten the washer and make it ineffective. Be very careful not to overtighten tapered plugs - found on modern Ford cars - or they may be difficult to remove again. Tighten each plug a quarter of a turn beyond hand-tight. Refit the leads to the correct plugs. Cleaning sparkplugs and grit blasting. Normal: light browncolour. Dirty: powderydeposits. Black carbon: anover-rich mixture, ortoo much choke. 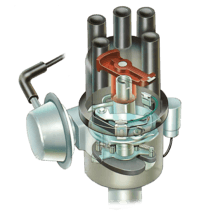 Oil fouling: worn valves orpiston rings. Pre-ignition: causesthe inner electrode tobe burned away. 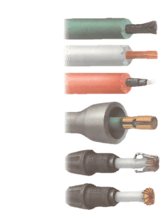 The best way of cleaning plugs is by grit blasting, but if they are not too dirty you can clean the electrodes with a fine, flatfile. Make room for the file by carefully levering open the gap with a gapping tool or a thin screwdriver. If the treads are dirty, clean them with a soft wire brush. Wipe the whole plug with a soft cloth to remove dirt. Make sure the top of the ceramic insulator is clean. As an emergency measure for damp or heavily fouled plug, gently heat the tip with a gas ring or blow lamp. This cleans both the electrodes and the inside part of the insulator. A grit blaster run off the car battery. Many garages have grit blasting equipment, and will clean plugs for a small charge. You can also buy a home grit blaster, which runs off a car battery. The plug fits through a rubber seal into the grit chamber. A few minutes running cleans even the dirtiest plugs.